“If your vision is one year, plant rice. If your vision is ten years, plant trees. If your vision is one-hundred years, educate your children in the arts.” -Chinese Proverb. Every once in awhile something happens that prompts me to get up on my soap box about how under appreciated the Arts are in this country. The other day I was at a meeting of English, Communication and Theatre instructors at the local community college where I teach part-time. One of the instructors brought up the fact that English and communications are required classes for every degree. But I was thinking, why aren’t the Arts also required. In my humble opinion you can learn a great deal about yourself by creating a work of art. I agree with Brian in so many ways, it’s almost as if I wrote the blog post myself. Theatre teaches critical thinking skills, how to think on your feet, how to gain insights into what makes humans tick, how to be resourceful, and creative. It also teaches, self-discipline, self-awareness, and self-esteem. The common wisdom is that playing a team sport does all those things for you, and I’m not saying they don’t, but sports are about competition. The performing arts teach cooperation. Dr. Brené Brown writes in Daring Greatly, “We are hardwired to connect with others, it’s what gives purpose and meaning to our lives, and without it there is suffering.” That passage resonates with my life experiences. I feel bad when I’m in competition with someone, and good when we’re cooperating. After a theatrical performance, there are no riots, because one actor did a better job than another. Most of the time people leave the theatre feeling good, thoughtful, and enriched with a new perspective. I’m not sure we have those feelings after any kind of sporting event, especially when our team loses. Okay, enough complaining. Since we live in a bottom-line culture, I’ll get to the bottom-line of why having two theatre degrees has been good for me. It’s helped me in my personal and work relationships. Actors and directors learn to analyze the motivations of the characters in the play, which helps us understand the motivations of the people we come in contact with every day. Understanding human nature helps me communicate better. I’ve also learned how to read body language, which comprises 95% of our communication. We think words are of vital importance; we learn more from non-verbal clues, if we’re paying attention. Theatre also taught me how to express myself in more effective ways, because part of the acting process is to listen, think about what was said, then decide how to respond. That’s a good practice in every day life too. One of the most important things I learned from my theatre experiences is to think critically. A group of people take a play look at all the “problems” that have to be solved in order for the production to be a success. They tackle each one, and little-by-little the production comes together until opening night when the audience tells them whether or not they did a good job. This kind of work is internal. It doesn’t show up on a spread sheet in neat little columns. 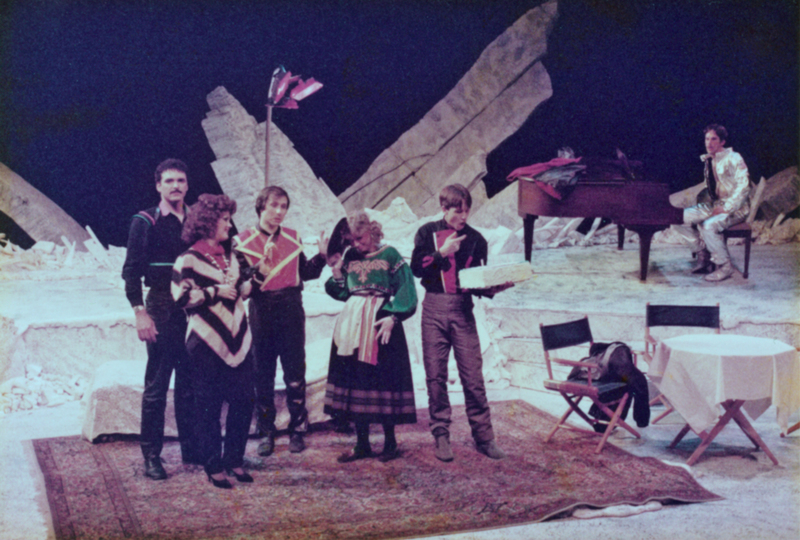 To quote Brian Sibley, “You have to make tremendous inferences and intellectual leaps…” to make the production a success. In other words, you have to think outside the box. In my opinion, we could use a lot more of those people in all kinds of business endeavors. Finally, I have to mention how good being involved in the Arts is for self-esteem. I’ve had students who were shy, or not interested in school, or who needed a place to belong, who blossomed as a result of taking drama, or getting involved in their local theatre troupe. Being an artist uses a very different skill set than being a scientist, mathematician, jock, computer nerd, or working with your hands. In most of those fields, the work that’s done is quantifiable.The effect of a work of art on both the audience and the performers isn’t measurable. Yet, would we give up going to the movies, concerts, art galleries, dance recitals, or plays because we can’t define what it is we get out of those events? Every parent who goes to see their child perform, is proud beyond measure, and that’s as it should be. Their pride and the child’s achievement can’t be measured, but it still enriches. So, the next time you’re thinking that your school district should cut the art, band, choir, dance or theatre program, just remember that you’ll be denying an entire student population of that school district a chance to gain confidence, and learn some great skills that they will use their entire lives. And I’ll end by saying, I think every college and university student should be required to take theatre classes as part of their degree program. After all, aren’t we tired of the lack of communication in business, and particularly in our government. People in every profession can use the empathy and critical thinking skills they could learn from involvement in the Arts.